The realism of a Star Wars movie is.... not a sentence that anyone should write, ever. 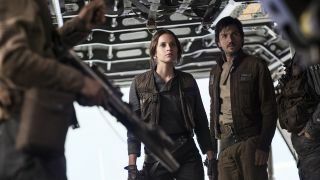 Well, like it or not, the beloved franchise continues to evolve from its sci-fi fantasy beginnings into something with a more grounded feel in Rogue One: A Star Wars Story. Gareth Edwards made it clear from the start this prequel spin-off is a proper war movie. Forget gloss. It'll be a grimy, gritty look at galactic conflict. Actor Diego Luna has now confirmed that he approached his role in very much the same way. “I wanted to make my character more natural and realistic," he tells Mexican Vanity Fair, "Although people expect the tone of the film to be fantasy, it actually is quite the contrary. It’s an intimate story that feels real." That's one of the highlights of this Star Wars entry in particular. This lot aren't superheroes - and they're not Jedis - they're just normal folk, trying to stop a tyrannical regime. Understandably, that's going to require a fair amount of physical exertion. Keeping with the spirit of The Force Awakens, which opted for plenty of practical effects over digital, Rogue One's actors were really put through the ringer. While there were probably plenty of stuntpeople on set, it sounds like the onscreen talent weren't immune to keepin' it real. Wonder if any will become as legendary as *that* Stormtrooper accident.